On Friday, March 29, Marjorie Manwaring (aka Marge) and Raul Sanchez will read poetry at the Lucia Douglas Gallery (7 pm). The very next day, Marge is our featured guest instructor for a poetry writing workshop where participants will begin to understand her notable concepts for the persona poem. When we post an official announcement for this workshop, be sure to sign up early. Seems people are pretty enthusiastic about this poet and her work. The man by my side, patting my collar down, brushing cat fur from my sleeves before my appointment with the magician—he knows, my husband, the importance of these nights and yet still wonders what it is I seek at the magician’s house. He knows there’s more to it than a rabbit and a hat or a shell game and tonight his hands will linger on the abrasions—Yes, I’ll say, he’s still working on the sawing trick, almost got it down and I don’t know when this fantasy grew to such proportions—the magician, the magician’s assistant, but this man by my side, he sends me on my way and as I open the door he says, You forgot something, hands me my dog-eared paperback on illusion and escape. What aspects of your experience keep you writing poetry? Writing poetry (like any artistic pursuit, I suppose) is about more than sitting at the desk and writing (although that is important, certainly! ); it is constantly observing, being receptive to contradiction, looking for a way to connect seemingly unconnected things. Being vigilant. The impulse is always there to “take notes”—whether I’m in a museum, at an intersection looking at an oddly defaced street sign, overhearing a juicy snippet of conversation, or listening to a scientist speak on the radio. I think that maybe I’ve always had that impulse; it’s just that now I have a place to “put” my musings. Are there features of your life that have run contrary to you being, or continuing to be, a poet? The biggest obstacle to writing is time, and I know I’m not alone in that. For a while I was doing freelance writing and editing work, where I had busy and slow periods. During the slower periods, I had bigger stretches of free time to write and to “putter”—those stretches of time could be spent reading, imagining, letting my mind wander. For the past couple years I’ve been doing a 40-hour-a-week contract, so that variability in my schedule that I once had is gone. And, while once I have a draft, I can successfully work on revisions in small 15-minute increments if I have to, for me that isn’t usually the best environment for crafting a first draft. So, like for a lot of other writers, it is a matter of finding time (and of being disciplined, not getting distracted) in the evenings and on weekends for reading, writing, or just letting ideas percolate. If you could choose to meet a dead poet, who would that be? How did he or she impact your writing experience? I would love to meet Gertrude Stein. She fascinates me. Rather than bringing someone back from the dead, I think what I would really like is to time-travel back to her days in Paris, get invited to her salons, study her art collections, meet her friends, talk to her. While reading Stein, I learned that, despite a poetic style in which “meaning” is elusive and associative leaps are the norm, she writes with playfulness and a sense of humor, and that taught me something about comedy. As one example, there were places in her long poem Lifting Belly that made me laugh out loud—and this wasn’t because they were funny in the sense of a joke or humorous anecdote; despite the lack of conventional narrative, she was able to create comedic moments through the use of line breaks, repetition, and the unexpected juxtapositions of words and phrases. This seemed like something important to learn. Your work in the dark is not done. and roots to gnaw and swallow. Months of no distractions from the moon. Aside from a meditation on being a poet, on the work of creating something, on transformation, this poem was also a musing on the isolation, sometimes self-imposed, of artists, of their (my) introverted tendencies. What kinds of books outside of poetry and fiction have stimulated your poetry? Jay’s Journals of Anomalies: Conjurers, Cheats, Hustlers, Hoaxsters, Pranksters, Jokesters, Imposters, Pretenders, Sideshow Showmen, Armless Calligraphers, Mechanical Marvels, Popular Entertainers (Ricky Jay). Magical Mushrooms, Mischievous Molds (George W. Hudler). On Becoming a Woman, a 1950s book on dating and marriage given to me as a gag gift while in high school. Books I inherited from my grandparents’ library, such as Know Your Fish published by Sports Afield, and old cookbooks. Letters from people and entities. Which book of poetry is most important to you and your work as a poet? It’s hard to pick just one, so here are some that have been important for different reasons over the years. Complete Poems: 1913-1962 by E. E. Cummings. This 800-plus-page tome was the first book of poetry I ever bought (and the only one I owned at the time, save the poetry collections I’d been given as a child). I was a freshman at the University of Washington and taking a required introductory English class. We didn’t focus much on poetry in the class, but in the Norton Introduction to Literature anthology we read from, there were some poems by Cummings, and clearly they made an impression on me! Poetry, and Cummings’ experimental word acrobatics in particular, were so far removed from the science track I was pursuing at the time…it’s funny to think about. This was in the mid-80s. I would not try my hand at writing poetry, nor would I read poetry on a regular basis, until the late 90s, but I feel like this was one of those subconscious impulses—that perhaps I knew something about myself before I really knew it. The October Palace by Jane Hirshfield, and Otherwise: New and Selected Poems by Jane Kenyon. In the late 90s, I took a series of poetry writing classes through the University of Washington Extension (now the Continuing Education program). Through poems we discussed in class and recommendations from classmates, I came to know and love “the two Janes,” as I like to call them, Jane Kenyon and Jane Hirshfield. I was drawn to their meditative qualities, how beautifully they harnessed the power of the image, of the named particular, how their work evoked mystery and yet was firmly grounded in nature, in the household, in the challenges of illness and other human sorrows. Liver by Charles Harper Webb, and Reflections on Espionage: The Question of Cupcake by John Hollander. I believe I came to these books after completing the two-year program through the UW Extension. We had read a broad spectrum of poems, including work by David Trinidad, Denise Duhamel, and Thomas Lux, who incorporated pop culture references and humor into their poems. I remember driving in town doing errands and hearing a radio interview with Charles Harper Webb, who had just published his collection Liver. I was so taken with the humor, pathos, and linguistic energy of the poems he read that I added a trip to the bookstore to my “to do” list that very day. Around that same time, I think, John Hollander gave a lecture and reading at the University of Washington; he read from his book Reflections on Espionage, which had just been re-released. This book-length poem featuring a spy named Cupcake blew me away with its unusual subject matter (poems in the form of messages transmitted by agent Cupcake) and its exploration of secrecy, the search for meaning, and language itself. Both books enhanced my vision of what a book of poetry could be. Madame Deluxe by Tenaya Darlington. This book was on my reading list my first semester of graduate school. It, like Webb’s Liver, enchanted me with its smart humor, its references to pop culture, its playfulness with language, and its poignancy, but Darlington’s energy was distinctly feminine and would lead me into the works of Amy Gerstler and Carol Ann Duffy. Autobiography of Red by Anne Carson. I read this while in graduate school, too. It was the first Anne Carson book I had read. I feel like it propelled me into a different voice/sensibility in my writing—or that might be too strong, maybe it just opened up another poetic register to me. It’s hard to articulate, but I felt a shift in how I thought about poetry after reading this book. What do you believe your readers enjoy most about your work? People have told me they enjoy the humor in my poems and the sometimes peculiar lens through which I look at the world. Want to know a little more about Marge? 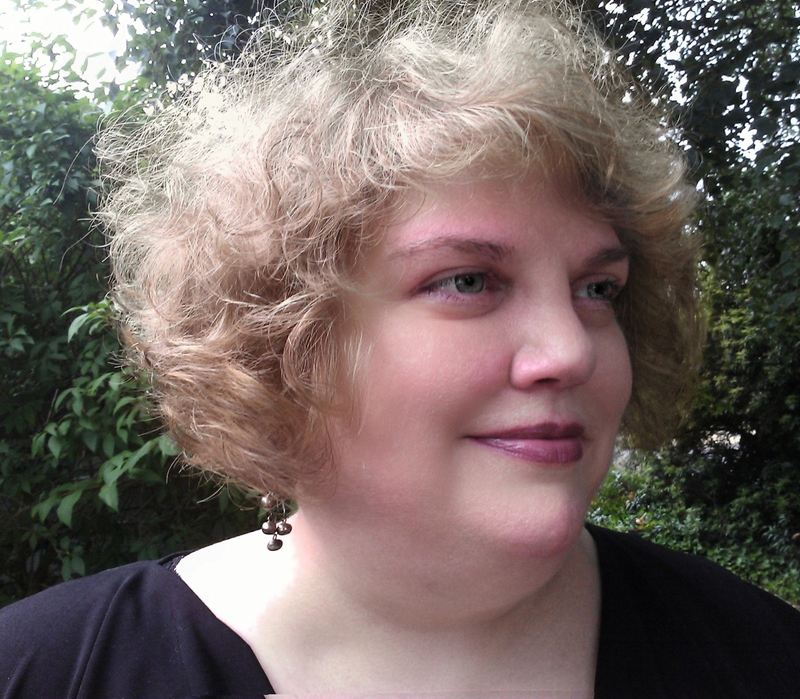 Marjorie Manwaring lives in Seattle, where she is a freelance writer/editor, co-editor of the online poetry and art journal the DMQ Review (www.dmqreview.com), and editorial board member for Floating Bridge Press. Her poems have appeared in a variety of journals and anthologies, including 5 AM, Sentence, Crab Creek Review, and A Face to Meet the Faces: An Anthology of Contemporary Persona Poetry, and have been featured on National Public Radio affiliate KUOW. 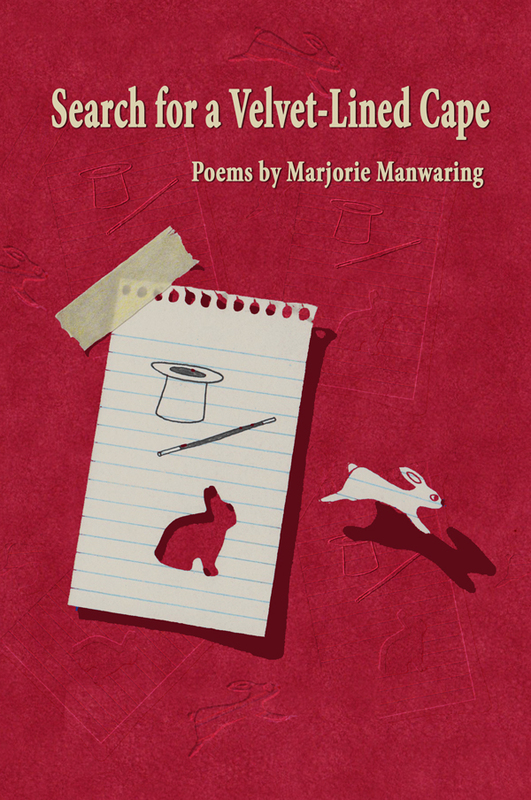 Marjorie holds an MFA in Creative Writing and Literature from the Bennington College Writing Seminars and is the author of two chapbooks, What to Make of a Diminished Thing (Dancing Girl Press) and Magic Word (Pudding House Publications); Search for a Velvet-Lined Cape is her first full-length collection. You can find out even more at her website: www.mmanwaring.com. Posted by Anita K. Boyle.